WORK is due to commence this week on the refurbishment of the two giant ships that Stena Line will be introducing on the Irish Sea later this year when the ferry company launches its new Belfast-Cairnryan route in November. The identical ‘sister’ ships Stena Superfast VII and Superfast VIII will be the biggest ferries ever to sail between Northern Ireland and Scotland and will undergo a refit programme at the Remotova shipyard in Poland which the company claims will ensure that they are the most modern, comfortable and best designed ferries ever to ply the Irish Sea. 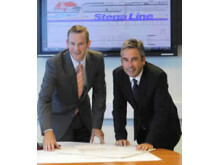 Stena Line has appointed specialist marine outfitters MJM Marine from Newry, a company with considerable experience in the global cruise ship industry, to ensure that the new ships are fitted out to the highest standards in order to provide customers with a unique top quality ferry travel experience. Paul Grant, Stena Line’s Route Director, said: “In November this year we will be launching a new purpose built port and terminal at Cairnryan in Scotland which will herald a new route for our Northern Ireland to Scotland service and we will also be introducing two identical ships onto the route, the biggest ever ferries to sail between Northern Ireland and Scotland. 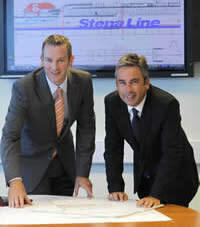 Stena Line route director Paul Grant (right) and Jonathan Guest, of MJM Marine, review plans for the refurbishment of the two giant ships for the new Cairnryan-Belfast route launching in November. “It will be a huge milestone for this service and the culmination of an ongoing investment programme which started with the construction of our new terminal at VT4 in Belfast back in 2008. The combination of the new port and ships will enable Stena Line to reduce the journey time to 2 hours 15 minutes and will provide a level of quality, comfort and facilities never before seen on the Irish Sea. “Not only that, the fact that the two ships are identical, allied with our already excellent customer service, means that customers are guaranteed a consistency of top quality on board service and facilities that we haven’t been able to offer before, another great advantage for passengers and freight drivers. “That’s why we have appointed specialist marine outfitters MJM Marine who have a wealth of experience in the cruise ship industry and will play a vital role in enabling us to offer customers the best possible ferry travel experience,” he added. “The ship layout will also be changed to accommodate our freight customers and I’m delighted to say that for the first time on the route, there will be no deck height restrictions, which means that we can accommodate virtually any load our freight customers have. We believe that this, alongside the fact that we sail direct from and to Belfast with easy access to the motorway system, will provide us with a unique competitive advantage in the market,” concluded Mr Grant. Jonathan Guest, Managing Director of MJM Marine said: "We take immense pride to be involved with these prestigious refits and view it as an endorsement of MJM's knowledge and experience of working with Stena on their Irish sea routes." Built in Germany in 2002, the new Stena Superfast vessels will each be able to accommodate 1200 passengers, 660 cars or 110 freight units and will operate up to 12 daily departures between Belfast and Stena Line’s new port at Cairnryan, all year round. NOTE TO EDITOR: For further information please contact Michael Rafferty of Duffy Rafferty Communications on +44 (0) 28 9073 0880.